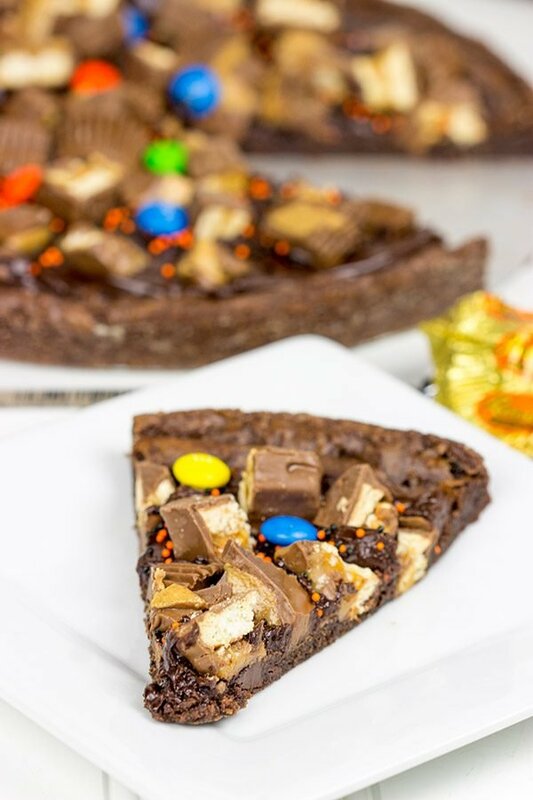 This Brownie Pizza is a fun way to use some of that extra Halloween candy this year! I’ve always been fascinated with mythical creatures. I’m not referring to mythology here…although I do love me some Roman and Greek mythology. Nope, I’m referring to the creatures, monsters and other legendary mutants that roam the countryside. Not surprisingly, these stories surface a good bit more around this time of the year…and I love ’em! Sasquatch (aka Bigfoot). So I’ve always wanted to find a sasquatch. I’ve even sat down and watched those tv shows where people go out hunting a sasquatch. Call me crazy, but it’s just fascinating to me! Loup Garou (aka werewolf). We’re not talking Teen Wolf with Michael J. Fox here. We’re talking the real deal. I first learned about the loup garou when I was living down in Louisiana. This mythical creature supposedly wanders the swamps of south Louisiana. As the legend goes, this half-man, half-wolf creature targets misbehaving Cajun kids as well as Catholics who break the rules of Lent. If that isn’t scary, I don’t know what is. I’m perfectly happy not running into the loup garou in a back alley or swamp somewhere. Thanks, but no thanks. Headless Horseman. Ok, so this one is well-known thanks to the many kids’ books and cartoon recreations. But the actual story of the Headless Horseman is pretty terrifying. This story appears in both European and American folklore, but the story from Sleepy Hollow is most appropriate given that Halloween is almost here. According to legend, a solider was struck in the head by a cannonball during the Revolutionary War. He was buried in the Old Dutch Church in Sleepy Hollow, and he rises every Halloween night looking for his lost head. Creepy. Especially given the fact that Sleepy Hollow, NY and the Old Dutch Church are only a couple of hours south of here. I’ve driven by the cemetery years ago, and I kinda want to go back. On Halloween. Anyone want to come with? 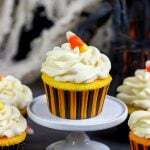 Are you guys inundated with Halloween candy yet? Every year, I jump the gun and get a couple several many bags of Halloween candy when they show up on store shelves. (Nevermind that they seem to show up in early September now…) How do you like to eat Halloween candy? I prefer to eat mine as quickly as possible and then hide the wrappers. Haha. Just kidding! I claim to buy the Halloween candy for our trick-or-treaters, but I think I end up eating more than I give out. Can you blame me? Those little bite-size candy bars are just sitting right there looking at me. This year, I decided to take some of those candy bars and turn them into a legitimate dessert. Pizza nights are popular here in the Spiced house, but this time I went sweet. Like a Brownie Pizza. With chopped up Halloween candy on top. This sweet treat turned out quite well! And the best part is you can tailor it to your own candy stash. Don’t have Reese’s and Twix? Then use Milky Ways instead. Or toss on some Tootsie Rolls and gummy bears. Have fun with this one…it’s Halloween after all! But save a piece for me. I’ll be hungry after my sasquatch hunt in the back yard. Have you ever seen Bigfoot? What is your favorite (or least favorite) Halloween candy? Would it taste better on a Brownie Pizza? Using a medium saucepan, add the butter, unsweetened chocolate and ½ cup of chocolate chips. Place over medium-low heat, stirring often, until butter and chocolate have fully melted; set pan aside to cool. In a medium bowl, whisk together the eggs, sugar and vanilla. Stir the egg mixture into the warm chocolate mixture. In a separate bowl, sift together the flour, baking powder and salt. Stir the flour mixture into the chocolate mixture. Stir ¼ cup of chocolate chips into the batter. Pour batter into prepared baking pan. Bake at 350°F for 18-20 minutes, or until a toothpick inserted into the brownie comes out mostly clean. Let cool for 5 minutes and then use an offset spatula to smooth the melted chocolate chips evenly around the top of the brownie. Gently press chopped candy bars and other toppings into the melted chocolate. 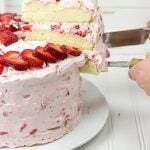 Let cool fully before slicing. oh my goodness!!! now this is a pizza!!!! 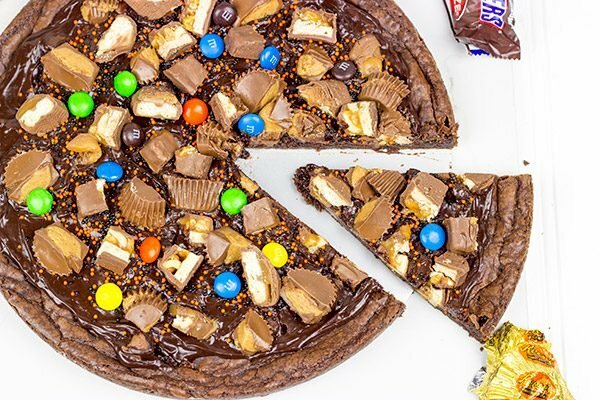 it’s crazy how much candy we already have in the house and there will most definitely be a ton more by the end of this month . . this brownie pizza is so happening!!! thanks for the inspiration! Haha! Thanks, Alice! Halloween is just an excuse to dress up in costumes and eat candy. 🙂 And when you have too much candy around (is there really such a thing as “too much”?) then why not make a brownie pizza?? Hahahaha! I am cracking up at this post, David! I had no clue there was a “scientific” name for all those mythical creatures! Plus I didn’t know the full story behind all of them, so thanks for the educational session! I am totally down to cruise the cemetery in Sleepy Hallow. I have a love/hate relationship with being scared. I love it right until I feel like I might pee my pants. 😉 Anyways, I do not have any Halloween candy in my casa, because living out in the country, I have been informed that we don’t get any trick-or-treaters. Bummer. But, I am sure my husband will come home with a dump truck full of candy sometime soon, just to consume by himself! 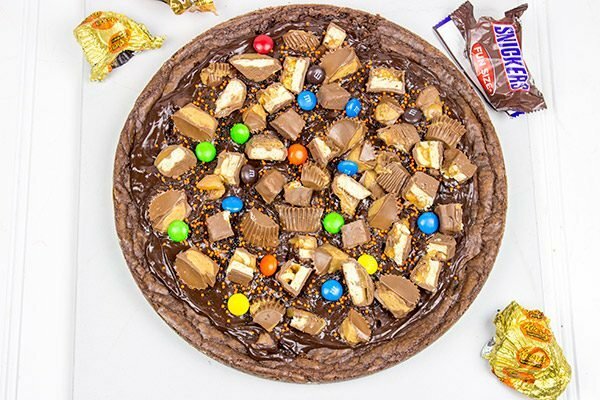 I am definitely going to whip together this brownie pizza will all the extra candy! This looks seriously decadent and absolutely delicious! I will have to drool as I watch my husband shovel this into his mouth.. because being allergic to cocoa, this would definitely kill me. #LifesNotFair. Pinned! Cheers, buddy! Thanks for the boogey-man creature scary monster roundup! I started seeing Halloween displays in AUGUST this year! That’s just wrong. I’m always in the mood for any kind of candy that involves peanut butter, but I particularly love those fruit flavored Toosie Rolls that only seem to be available at Halloween. I’m totally digging this brownie pizza too! Haha! Scary monster roundup for the win! Yeah, I think I saw the same Halloween displays in August…coupled with Christmas displays in late September. I mean, come on! (Although I did go and buy a strand of lights from the Christmas section, so that just encourages them to keep it up early. We needed a new strand in our basement for decoration!) You and my wife both love those fruit flavored Tootsie Rolls…blech!! Hah! Thanks, Rachelle! Hi David! This I my kind of pie! 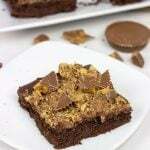 Quite a coincidence that Gary made brownies on Saturday with extra chocolate chips in them and melted chocolate chip “frosting”, topped with mini Reese’s! He’s become quite the baker lately as I’m still not completely up to speed! As for Halloween candy, I have never liked candy corn! Hey, Gary is totally channeling the right idea here! I think he and I would be good friends…and we’d eat a lot of brownies! 🙂 So I used to be bored with candy corn, but now I kinda like it. Except you HAVE to get the real brand of candy corn…none of that store brand stuff. It’s just not the same! Haha…now that’s what I’m talking about! I mean, if you happen to eat all of the Halloween candy early, then just grab some more…or turn the light off on Halloween and pretend you aren’t home! 🙂 Thanks, Rachel! Woah, now this is the kind of pizza I love! 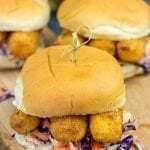 loaded with all the yummy goodness!! Difficult to name my favorite candy because I love it all!! Holy cow, David! Indeed, my first and only one sentence would be enough to express my profound thoughts. I’ve always had a skeptical eye at a sweet pizza idea – that sounds quite ridiculous to me. But not now. Something has just changed. And I’ve got a feeling the children from our area won’t get any candy this Halloween. Or maybe they will. Nobody knows yet (indistinct noise of unwrapped candy in the background). 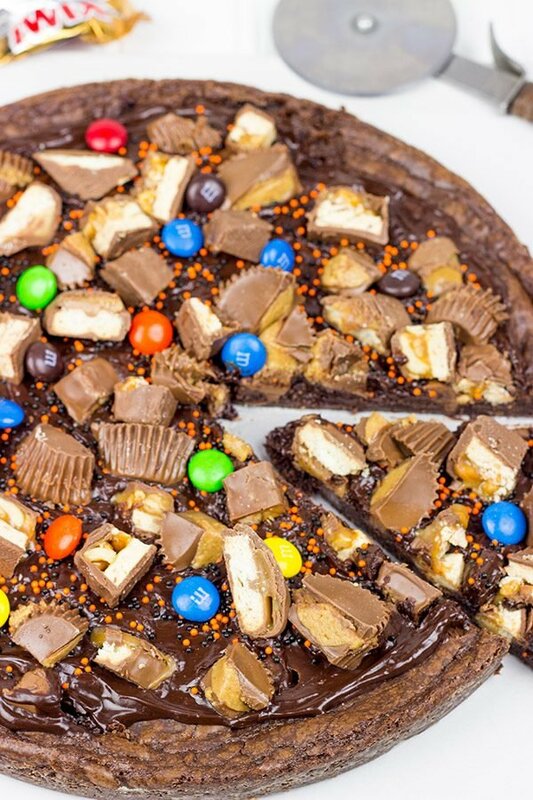 Love this loaded brownie pizza What a great way to use up all that candy we have lying around. It looks so fun and festive! Haha what a hilarious post! Also, I like brownies and I like pizza, so it sounds good to me. But, what is this extra candy you speak of? There is no such thing as extra. Extra candy is a total oxymoron! Those words just dont ever belong next to each other. Haha! I’m not sure what Halloween is like in the UK, but make sure to wander into some of the larger stores here in the States…it’s like a candy factory exploded and landed on the candy aisle! ps. 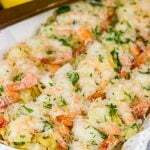 found your blog through Alice, Hip Foodie Mom and I´m happy I did! Hey! I bet if you just took a slice of this brownie pizza out to all of the monsters lurking in the woods, then they might be nice and just give you a big ol’ hug. Or they might eat you. It’s a 50-50 chance. 🙂 Thanks so much for stopping by…I’m about to head over to your site now! I’m such a huge BigFoot fan, he’s like the “coolest” of all. Speaking of cool stuff, this brownie pizza is really really cool. And I love how you can use whatever candy you want. Bigfoot wins at the game of Halloween monsters. I mean he can just stomp on anything he wants. Except ghosts. He might have a hard time with ghosts. Hmmm…this sounds like the basis for a really bad horror movie. 🙂 Thanks, Mike!! GAH!!!!!!!!!!!!!!!!!!!!!!!!!!!! This is the most beautiful thing… However, if it were a BLONDIE pizza… Then I would try and jump through my computer screen to scarf it down! Bigfoot? Mate, you’ve given me flashbacks of my favorite kiddy movie- The land before time!!! Although the main character was totally called little foot. I think. Oh man, I want to watch it now. So this looks ridiculous in the best possible way but I’m not sure how those pumpkin Reese’s will fit on it. I see peanut butter cups though!!! The land before time!! Man, I haven’t heard of that movie in years. Haha. Littlefoot. Totally not the same as his big lumbering beast of a cousin (who no one can seem to manage to take a photo of)! Peanut butter cups are one of the best Halloween candies ever, btw. Ever. BTW – our pastor’s 11 year old is OBSESSED with mythical jackalopes! He thinks they are real! When his dad took him into a taxidermy type store once, the people who had worked there had glued on some antlers onto a jack rabbit (jackalope) and, his boy found it and now refuses to believe they are mythical! Maybe this pizza might tempt him to believe the truth? This looks amazing! Haha…tell me about it, Shashi! I think I end up eating more when they are in mini-version instead of full-size version. I mean, they’re so small…just one more. That’s it. Just one. 🙂 Jackalopes are real…I have one in my backyard! Oh wait, I think that’s my dog. Haha. Thanks so much, Shashi!! 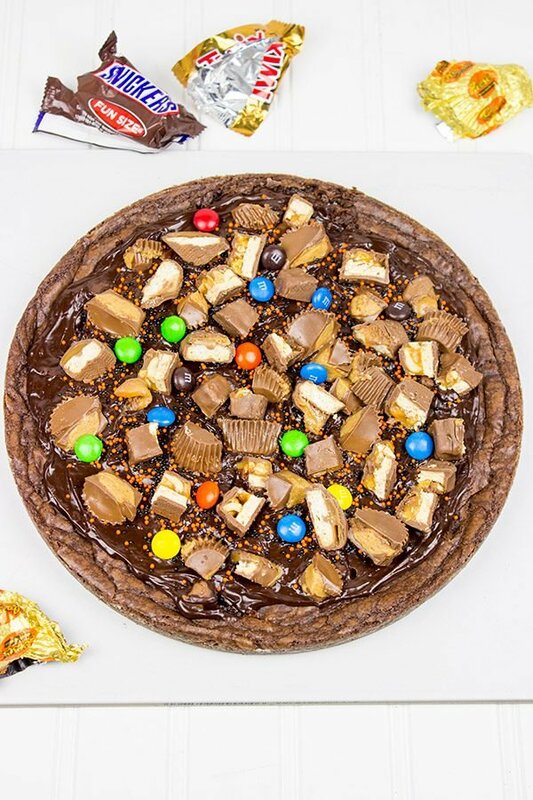 Oh this pizza is absolutely 100% ridiculous…but then again, so is Halloween candy appearing in the stores in August. And Christmas decorations in September. But I digress… I might have used too much of our Halloween stash making this brownie…and now I have to go to the store to get more for the actual trick-or-treaters. Haha! Oh my goodness this brownie pizza looks amazing David!! 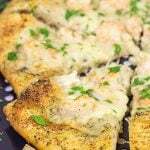 Love the idea of a sweet pizza instead of savory. 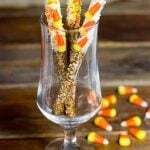 Also a great way to use up leftover candy from trick or treating! Well I am definitely a pizza guy and I can not wait to make this. Okay David I live in Louisiana and thanks to your education class here I had to go and google Honey Island swamp monster. lol I am ashamed to say that I knew nothing of this monster in my own state. Thanks for the education and the wonderful pizza. My kids will love this. Greetings to a fellow Louisiana native! Well, I guess I should say greetings from a former Louisiana native to a current one. So I’m thinking it might not be the worst thing in the world that you didn’t know about the Honey Island Swamp Monster. I mean he (or she?) is not exactly the kind of monster you want to bump into in the night, right? 🙂 Glad you stopped by, and I hope you enjoy this ridiculous pizza! (I say ridiculous because of the sheer amount of candy on top…haha!) Thanks, Quinton! Hahaha, oh my gosh, I buy Halloween candy every year “for the kids,” but really, my husband and I just eat all of them. I’m a huge sucker for kit kat, snickers, peanut m&ms, and that Hershey’s multipack of small chocolates. Needless to say, I usually need a bit of a cleanse after all that Halloween chocolate. What a fun idea to throw all this candy on top of the brownie! Hahaha…you and me both, Lisa! It’s “for the kids”…uh, yeah, something like that. I might have just downed a mini-Snickers after lunch just now. 🙂 I’m with ya, the early part of November is like the early part of January. I need to not eat dessert for a while just to recharge the batteries. Thank you so much for commenting! Thanks for the mythical creatures that stir history lesson friend! Now Loup Garou is a new one on me as is the Furry beast roaming the area near Joshua Tree I saw on TV last night on this kind of stuff. Love it too! Just picked up our candy supply from Costco last night, so we’re all set. I could mack on the tiny Snickers and Reeses all day long, so keep the bag sealed until the big night! Wait, there’s a furry Joshua Tree creature? Sure that isn’t just a hippy who got lost in the 70’s? 😉 I like your strategy here. Keep that big sealed until the big day…and then try to eat it all before the kids show up, right? Haha…thanks, Kevin!